Timothy H. O'Sullivan, born in 1840, is considered to be a pioneer photographer. In his relatively short career, he is credited as the first, or amongst the first to accomplish several feats in the field of photography. After an apprenticeship under photographer Mathew Brady in New York, O'Sullivan went with the photographers of Brady's studio to photograph the Civil War. Brady did not give credit to his individual photographers, so several photographers, including O'Sullivan left Brady to join the studio of Alexander Gardner. Prior to the time of the Civil War, photography was largely limited to portraits in studios. The Civil War was the first war to be photographed extensively. In the early days of photography, this task was very difficult. By the time of the war, photography had progressed beyond the era of the daguerreotype which required exposure times of several minutes. The collodion wet plate process used by O'Sullivan was an improvement, with exposure times of less than a minute in bright sunlight. But the process required a lot of equipment and a dark room both soon before and after the exposure, so field photographers often used a wagon on their photographic treks. With such long exposure times, action shots of the war were not possible. The long set-up time and the dangers of war also limited what could be photographed. Before battle, portraits of officers and groups of soldiers were often done. During battle few pictures were taken, but O'Sullivan tried, with his camera being hit in battle more than once. 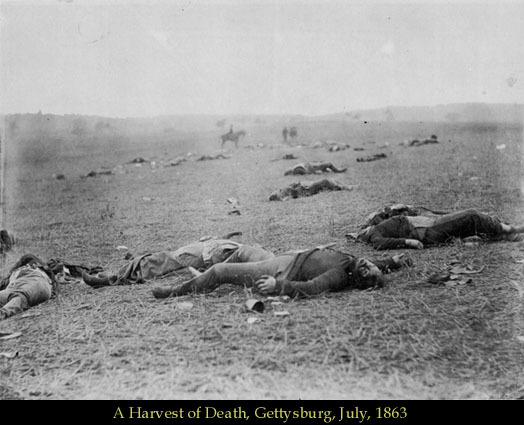 After the battle, the dead would be a frequent subject of photographs, since they tend not to move. From the photographs taken by O'Sullivan and others, Alexander Gardner produced a book, Gardner's Photographic Sketch Book of the War The photographs gave the general public a first look at the grim realities of war, versus the glorified paintings and drawings made of previous wars. While these pictures were considered true documentation of the war, research has shown that in some cases bodies were moved for pictures, and different views of the same dead bodies were identified as Union soldiers in one case, and Confederates in the other. After the war, Timothy O'Sullivan's reputation as a photographer gained him a position with a government survey of the American West. The first expedition was headed by Clarence King and explored the area of the fortieth Parallel, starting in California, in 1867. In Virginia City, Nevada, O'Sullivan was the first to take photographs underground in mines in America. He also took notable pictures of Pyramid Lake and of his photography wagon in the sand dune in Nevada. 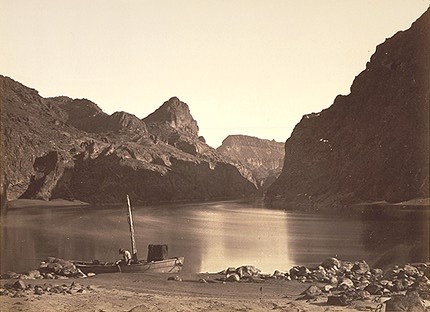 After a short expedition to Panama, O'Sullivan returned to the West to be the photographer on an expedition up the Colorado River. The expedition had three boats, with one boat named "The Picture" carrying O'Sullivan's darkroom and photographic equipment. After the Colorado River trip, O'Sullivan continued to explore Arizona and New Mexico, becoming the first to photograph many scenes that were to be captured countless times after him. The cliff dwellings in Cañon de Chelle (Canyon de Chelly) in Arizona and the Pueblos in New Mexico were most notably first photographed by O'Sullivan. The difficulties O'Sullivan encountered during the Civil War helped him survive the harsh conditions he met on the expeditions to the American West. Documenting the West with photographs was supposed to be an objective view of how it was out there, but in actuality, there was subtle bias. Clarence King wanted to gather evidence for his geological theories, so the pictures that O'Sullivan took or didn't take had to support King's theories. Other early photographers had other agenda on their mind when they took pictures, such as encouraging people to settle in these new lands. On the whole, O'Sullivan was probably more objective than many of the early photojournalists. O'Sullivan is perhaps less well known today than later Western photographers, but O'Sullivan was there first, and those later photographers learned from his ordeals.